On February 12th the Trump administration revealed its proposed budget for NASA. While the $19 billion in total funding provided was not much different from the levels approved by the Obama and Bush administrations, the new plan did manage to increase the incoherence in space-agency thinking to truly remarkable levels. Particularly outstanding examples of illogic were the administration’s decisions to cancel the Wide Field Infrared Survey Telescope (WFIRST) while proceeding with a lunar-orbiting space station dubbed Deep Space Gateway. WFIRST is a 2.4-meter space telescope with capabilities superior to Hubble, made possible on a bargain budget of $3 billion by the donation to NASA of a surplus spy satellite by the National Reconnaissance Office. It promises breakthrough discoveries of exoplanets and could potentially reveal the truth about the nature of the dark energy that is driving the expansion of the universe, and numerous other questions in astrophysics. It has been approved and strongly backed as a top priority by every scientific review committee advising the government. Deep Space Gateway (recently renamed Lunar Orbital Platform–Gateway), on the other hand, is a boondoggle that will cost several tens of billions of dollars at the least and serve no useful purpose. We do not need a lunar-orbiting station to go to the Moon, or to Mars, or to near-Earth asteroids. We do not need it to go anywhere. There is nothing worth doing in lunar orbit, nothing to use, and nothing to explore. It is true that one could operate rovers on the lunar surface from orbit, but the argument that it is worth the expense of such a station in order to eliminate the two-second time delay involved in controlling them from Earth is absurd. We are on the verge of having self-driving cars on Earth that can handle traffic conditions in New York City and Los Angeles. There’s a lot less traffic on the Moon. Yet the problem with Deep Space Gateway is much bigger than the waste of decades of time and tens of billions of dollars. The deeper problem is the form of thinking it represents. NASA’s astronomy and robotic planetary-exploration programs have achieved epic accomplishments because they are purpose-driven. In contrast, since the end of Apollo, NASA’s human-spaceflight program has been purpose-free. As a result, its accomplishments have been negligible. If the goal is to build a Moon base, it should be built on the surface of the Moon. That is where the science is, that is where the shielding material is, and that is where the resources to make propellant and other useful things are to be found. The best place to build it would be at one of the poles, because there are spots at both of the Moon’s poles where sunlight is accessible all the time, as well as permanently shadowed craters nearby where water ice has accumulated. Such ice could be electrolyzed to make hydrogen-oxygen rocket propellant, to fuel Earth-return vehicles as well as ballistic hoppers that would provide the base’s crew with exploratory access to most of the rest of the Moon. The Trump administration says that it wants to return to the Moon, but its actions are not consistent with that goal. 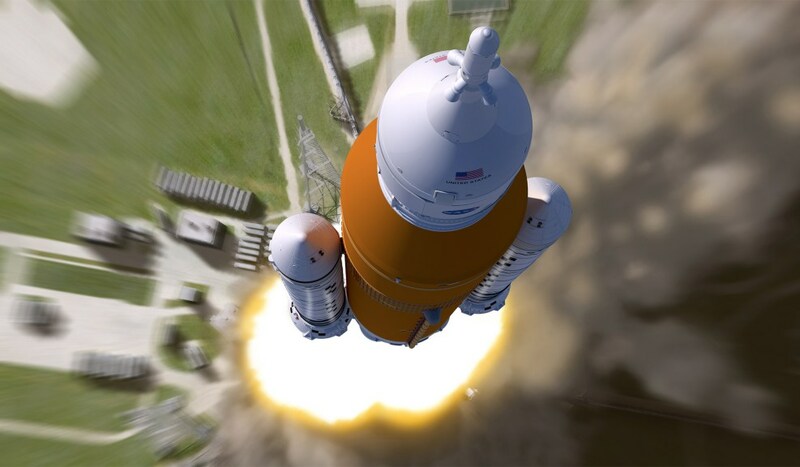 In addition to the nonsensical lunar-orbiting project, its budget projects spending $7.5 billion over the next three years on preparing the Space Launch System (SLS) for its first flight, when we already have SpaceX’s Falcon Heavy, which can lift 70 percent of the SLS payload at one-tenth the cost. The same funds, if spent on developing landers and ascent vehicles, could enable a return to the Moon within four years and human missions to Mars in eight. The situation is truly ironic. With the success of Falcon Heavy, America could be poised right now for a breakthrough into space. The cash available is adequate. What is lacking is intelligent direction. We will never get to Mars if we allow our human-spaceflight program to be run as a random walk. NASA didn’t get to the Moon by fishing around for things to do with stuff created by a haphazard set of constituency-supported programs. It got there by a embracing a clear purpose and acting accordingly. Instead of wrecking NASA’s healthy purpose-driven science efforts, the Trump administration should be focusing on providing comparable rational guidance for a human-spaceflight program that remains scandalously adrift. Dr. Robert Zubrin is the President of Pioneer Astronautics and Founder & President of the Mars Society. A full discussion of the future of NASA and the human space flight program will be held during the 21st Annual International Mars Society Convention (Aug. 23-26, Pasadena, CA). To register for the Mars Society convention, please click here.